We had some leftover pork, so I chopped it up and added it to a simple veggie/bean soup. Sautee the veggies in some olive oil in a deep pot until beginning to color. Add the stock and bring to a boil. Reduce to a simmer and add all the other ingredients. Simmer for about an hour, until the beans are tender. Quick and easy, with leftover brussel sprouts. 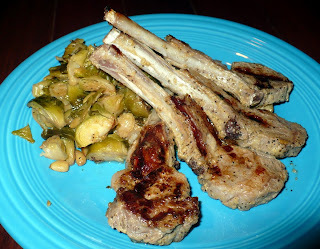 Marinate the lamb chops in the other ingredients for about an hour. Then grill for about 5 minutes in the George Foreman. Another delicious Thanksgiving at home. 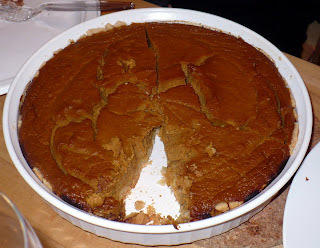 I don't like pumpkin pie, but this one seemed like a hit last year, so I used it again this year. In a sauce pot, combine the pumpkin and spices over low heat, stirring for a couple of minutes. This mellows the spices a bit. 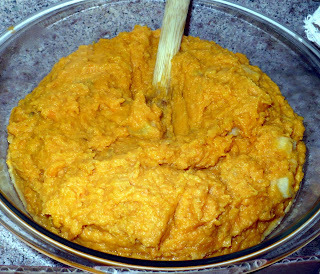 Dump the mixture into the food processor and puree for a minute. Add the half and half while pureeing, then the vanilla, then the eggs, one by one. Pour into partially baked pie shell. Bake at 375 for 1 hour or until a toothpick comes out clean. Mix flour and butter with your fingers until it resembles the texture of coarse cornmeal. Add water, 1 tb at a time, until you can form a cohesive ball of dough. Roll or press into a greased pie pan. 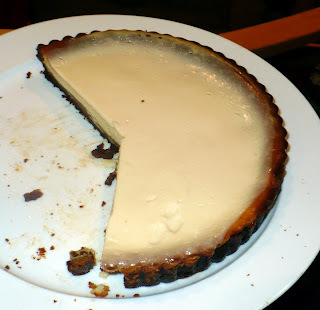 A friend brought this, so I don't have the recipe, but I should ask her for it because it was absolutely delicious. Toss the apples with the lemon, sugar and cinnamon and set aside while you pre-bake the crust. Bake bottom crust on 350, pressed into a pie pan for 10-15 minutes, until just beginning to color. Remove from oven and add the apple mixture. Roll out the other batch of dough and place over the top of the apples, pressing into the edges. Trim excess dough. Poke in several places with a knife or fork to allow for steam to escape. If you do not do this, your pie may explode in the oven. Bake on 35 for about 45 minutes, until the crust is golden brown. Super decadent and always a crowd pleaser. Combine the sugars, corn syrup, vanilla, salt and eggs. Stir in the pecans and chocolate chips. Pour into a partially baked pie shell and bake on 375 for 45-50 minutes. 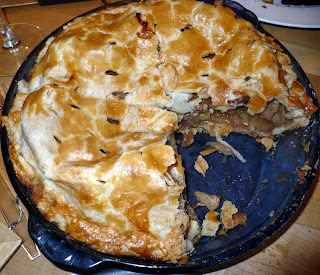 This was a new recipe and the tartness of the apples really took the starchy edge off the sweet potatoes. Boil the potatoes until fork tender. In the baking dish, bake the apples for about 40 minutes on 350, until tender. Drain the potatoes and mash them. Add the rest of the ingredients and stir to combine. 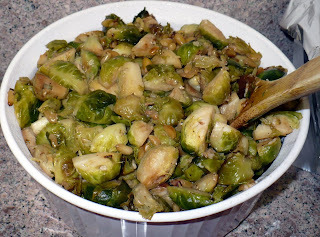 Brussel sprouts are a favorite veggie of mine for the holidays, although I hated them as a child. This was a tasty, bright rendition. In a large pan, sautee the brussel sprouts on medium. When brussel sprouts are tender and slightly caramelized, season with the rest of the ingredients and serve. Remove sausage from casings and sautee until browned, breaking up the sausage into small bits while cooking. Remove the sausage from the pan. In the same pan sautee the onions, carrot and celery until translucent. Pour the egg and broth on the bread and stir to coat. Add the sausage, thyme and veggies to the bread mixture. 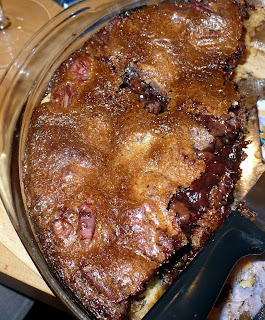 Spead the mixture in a large baking pan bake on 350 for 30-45 minutes, until crust is nice and brown. 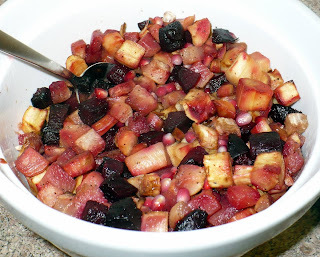 A friend made a root veggie salad with pomegranite last year and I decided to riff on that for this year. The brightness of the pomegranite really contrasts nicely with the earthiness of the root veggies. 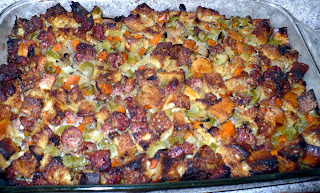 Spread the diced veggies on a large baking sheet or jelly roll pan. Season with salt, pepper and olive oil. Roast on 375 for about and hour, or until tender. Toss with pomegranite seeds and serve. This is Alexis' mom's recipe and these rolls are always a hit. Scald the milk and remove the film from the top. Add the butter and the sugar to the milk and stir to dissolve. When milk is cool to the touch, add the egg and stir to combine. Dissolve the yeast in the warm water, wait 10 minutes, and add it to the mixture. Then add enough flour to make a thin batter. Let this rise on the counter, uncovered, for 2 hours. Add the salt, baking powder, the baking soda and enough flour to make a stiff dough. Knead the dough on a floured surface until smooth. Put the dough in a greased bowl, cover with a damp cloth and store in the refridgerator for 24 hours before using. 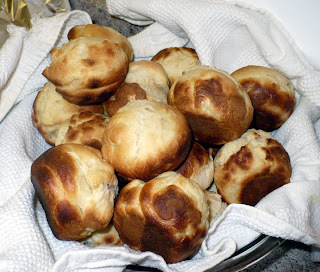 Pull off small pieces of dough, roll into balls and place in a greased muffin tin. Bake at 450 for 10 minutes, or until golden brown. 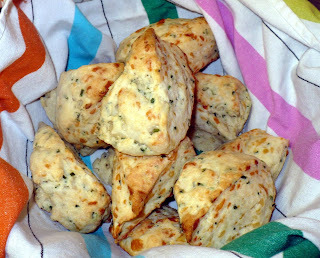 We decided to call these "biscuits" this year instead of "scones". I think that did the trick, although we've always liked these, no matter what they are called. Combine the dry ingredients. Mix in the cheese and chives. Add the cream and stir until a dough forms. You may need to add a little more cream to get a dough to form. Put the dough on a floured surface and knead a several times, until the dough is smooth. Separate the dough into 2 parts and form each into a disc about 1 in thick. Cut each disc into 8 trianuglar pieces. Spread out the pieces on a large, greased cookie sheet and bake on 400 for 20 minutes, or until golden brown. You really can't go wrong with bacon. Sautee the bacon until crispy. Drain out some of the fat. 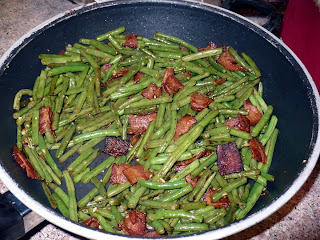 Add in the garlic and green beans and sautee until tender. Season with pepper. We decided to have another Thanksgiving sans turkey because, really, no one likes turkey. 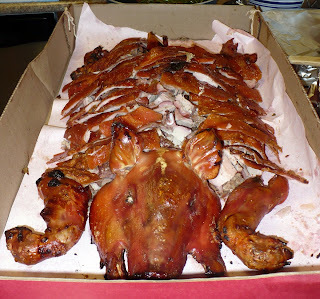 This was the smalled pig we could order from Toon Kee, at about 20 lbs and $140. 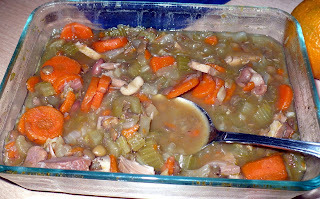 The meat was very moist, tender and flavorful and there was a lot of it. The skin was crispy and perfectWe sent people home with bags of pork and we ate it for days. It was also really nice to order the pig and just pick it up down the street right before we were ready to serve dinner. This allowed us full use of the oven for the rest of the food. We hadn't had lettuce cups in a while and they were quite tasty. 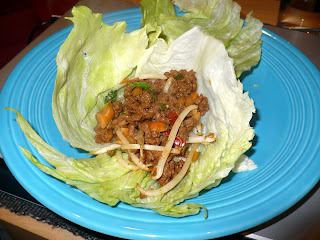 Click here for the basic recipe I use, but lettuce cups are a really great meal for using up odds and ends in the fridge. I always include some type of ground meat, chopped nuts of some sort, water chestnuts and/or bean sprouts for crunch, and whatever veggies or greens I happen to have lying around.